Just as your desktop computer or laptop can display a pretty picture or pattern as a desktop background called a wallpaper, your iPad can display an image on the Home screen and the same or another picture that displays when your iPad is locked. The picture of blue water that’s the default iPad image may be pretty, but it may not be the background that’s most appealing to you. Choosing different wallpaper may help you to see all the icons on your Home screen, or just allow you to display an image that appeals to your artistic sensibilities. 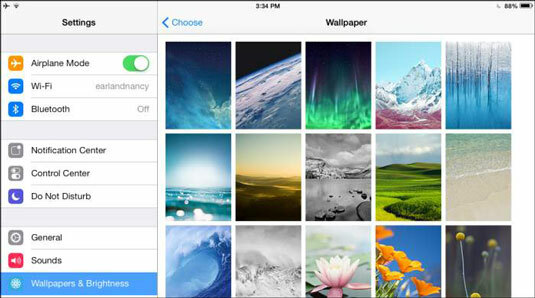 In the Wallpapers & Brightness settings that appear, tap the iPad images displayed in the Wallpaper section. In the pane that appears, tap either Dynamic or Stills under Apple Wallpaper to display wallpaper images. Dynamic images use animation, and stills are static images. You can also use your own picture for your wallpaper. Instead of choosing Apple Wallpaper, tap Camera Roll (Saved Photos on an original iPad) or choose a Photos library such as My Photo Stream to browse your saved photos, select the picture you want to assign, and then resume with Step 5. In the Wallpaper pane (see the figure), tap a wallpaper image. A preview of that wallpaper appears onscreen. Tap Set Lock Screen (the screen that appears when you lock the iPad by tapping the power button), Set Home Screen (to use as the wallpaper), or Set Both. You return to your Home screen with the new wallpaper set as the background.